The Millside Lleyn Flock was established in 1997 following the purchase of 75 quality females at Gaerwen and 2 top class rams at Carlisle, one from flock 809 and the other from flock 333. The flock is MV accredited and now has 200 ewes, mainly the progeny of some of the top flocks in the country. 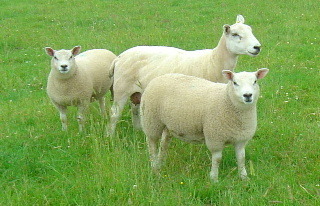 Selection has always been on breeding well grown sheep with tight skins and good conformation. 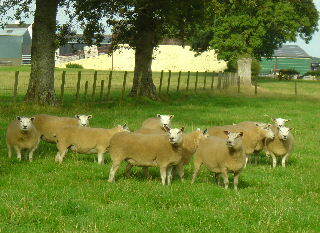 The Lleyns are reared on an all-grassland farm in SW Scotland alongside a flock of pedigree Blue Texel sheep. Although most of the Lleyns are bred pure, a small number are crossed with the Blue Texel for prime lamb production with some of the females being kept for commercial shearling gimmers. Lambing takes place late March/early April, the ewes being housed only for convenience, and are turned out as soon as possible following lambing – weather permitting. 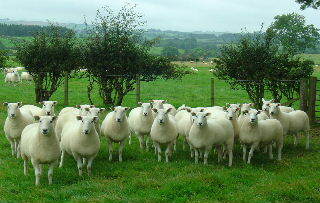 All ewe lambs are retained for a further year and are over-wintered on grass only at a nearby dairy farm. Lleyn Ram lambs retained for Shearlings are housed in December and turned out prior to lambing to allow extra accommodation. Present Lleyn stock rams are from Emrys and Dylan Jones – flock 599 and from Messrs DN Bennett & Son – flock 893. Progeny from the Millside Lleyn flock is available annually both at Lleyn Sheep Society sales at Ruthin, Stirling, Carlisle and Skipton and also a pen of Lleyn Shearling Rams at the Kelso Ram Sales. We also welcome private sales. Lleyn Rams have also been in demand with successes in recent years including 4600 gns. for the Male Champion at Carlisle in 2002, and, more recently Shearling Rams to 4500 gns., 4000gns. and 2200gns..
We also have a selection of unregistered Lleyn Shearling Rams and Lleyn Ram Lambs suitable for commercial sheep flocks – these are on offer at Ram Sales at local markets or privately. Also available are Lleyn shearling Gimmers and Blue Texel x Lleyn shearling Gimmers suitable for crossing or possible recipients for embryo transplants.